Whenever I’m shopping for a new skillet or sauté pan, the first thing I do is lift it. Usually, the cheaper the pan, the lighter it feels. Meaning there’ll be very little metal between the flame and whatever it is you’re cooking. You want a pan with a satisfying heft to it—otherwise, you’re going to be scorching stuff on the bottom before the rest of the food even has a chance to get warm. Cookware doesn’t come much heftier than cast iron. That solid, lift-with-your-knees weight assures even heating, great heat retention and generation-spanning durability. 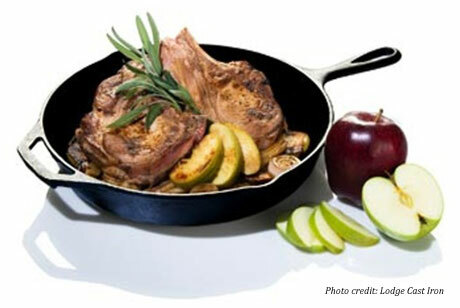 This sturdy, no nonsense cookware is enjoying renewed popularity these days among a whole new generation of cooks. So I was pleased to hear that the best cast iron out there is still made right here in America, in the town of South Pittsburg, Tennessee (population 3,300 or so), where it has been since William McKinley was president. Lodge Cast Iron is the last cast iron cookware company still in daily production in the United States. And refreshingly, this wonderfully hefty cookware doesn’t come with a hefty price tag. To find out more about the innovations that have kept this culinary tradition alive—and made their cookware the industry standard.